There are several ways to make your ceremony truly feel like you – little touches that will make your ceremony truly feel personal. Here are a few of our favorites. The ceremony is the most important part of the wedding day – it’s the reason why your nearest and dearest have gathered to celebrate. 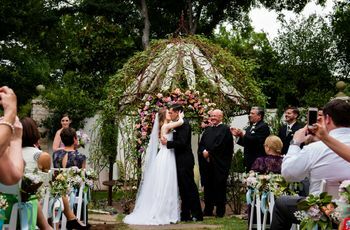 Of course, wedding ceremonies come in all shapes and sizes, and it’s up to you and your future spouse (and your officiant) to decide how you’d like the proceedings to go. But there are several ways to make your ceremony truly feel like you – little touches that will make your ceremony truly feel personal. Here are a few of our favorites. Your officiant is the one who will lead your ceremony, so it’s important to choose someone who is interested in getting to know you and your spouse. Meet with your officiant several times before your wedding, if possible, to make sure he or she understands your personalities and your story, as well as any needs or desires for the actual ceremony. Get nostalgic by including accessories or other items passed down from family members or friends. 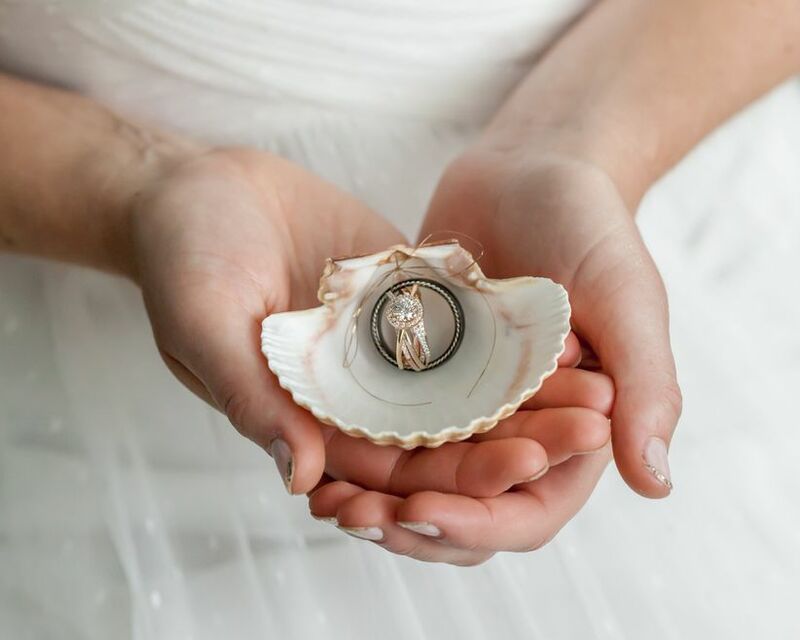 For example, attach your great-grandmother’s locket to your bouquet, or include a religious item that has been in your family for generations. Display photos of you and your spouse in the entryway to your ceremony space, if allowed. This will give your guests a quick summary of your history as a couple before they watch you wed.
Children are unpredictable – but they also add a lighthearted and fun-loving touch to a wedding ceremony. You can go the traditional route with your ring bearers or flower girls (who are usually ages four to ten, by the way), by asking them to carry ring pillows and baskets of petals, or try something a bit out-of-the-box with signs, ribbon wands, or something totally unique! 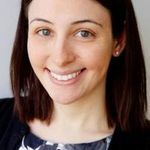 And remember if your littlest attendants don’t behave like little angels during their walk down the aisle, just laugh it off – it’s all part of the fun of the day! Some ceremonies require specific musical selections, but if you have any flexibility in the score of your ceremony, choose songs that are meaningful to you and your future spouse. 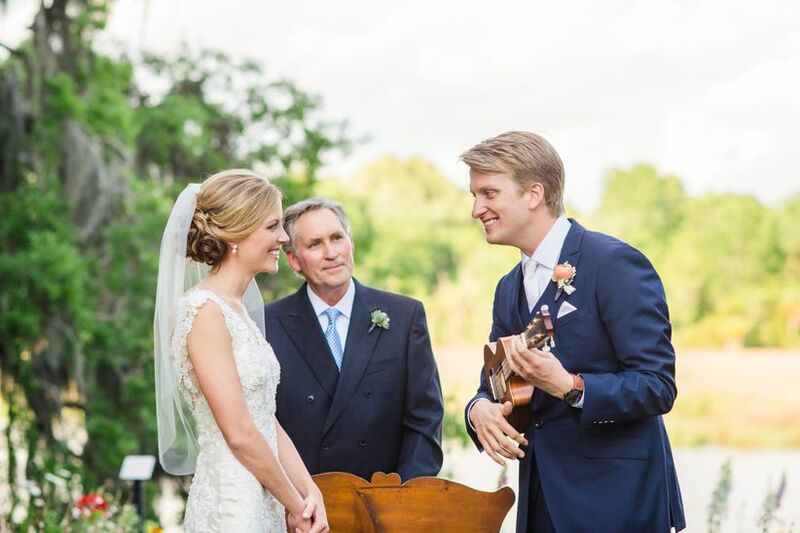 It’s usually best to keep to instrumentals for the processional and recessional, but you can also include other songs as interludes during the ceremony proceedings. Everything from Beatles songs, pop tunes, jazz standards, and more are all fair game. Your guests don’t have to choose sides – keep the seating plan open so that guests can sit wherever they’d like and mix and mingle with one another, adding to a “one big happy family” vibe. Some creative signage can help get the message across. A subtle nod to loved ones who have passed away can be a sweet and meaningful gesture. A few ideas: placing a photo of the family members or friends on a chair in the front row, or including their favorite flower in the ceremony décor. You can also include their names in your programs, or feature a favorite song or passage as a reading or interlude. There are a few things you should include in your ceremony program – the order of the proceedings and a list of the wedding party members are usually musts. However, there are other optional items that can make your program even more personalized. 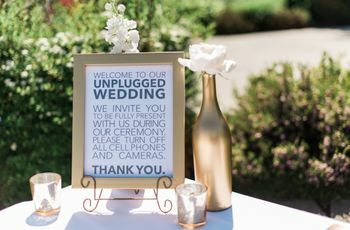 Include a thank-you note to your guests, a tribute to loved ones who have passed on, or even a favorite quote or song lyric that you feel is appropriate for the big day. The design of the program should have a similar feel to your wedding décor to keep things consistent. If your wedding rings have special meaning, your officiant can mention this in your ceremony proceedings. Another ritual we like for smaller weddings: passing your rings around the audience so that each of your guests can give them their own blessings. Your pet is an important member of your family, so you may want to include him or her into your ceremony. Of course, you’ll have to get the okay from your venue first, but there’s little cuter than a furry friend dressed to the nines making his or her debut down the aisle. Think about the weather on your wedding day – especially if you’re hosting an outdoor ceremony. If the weather will be particularly warm and sunny, offer your guests fans, parasols, and make sure cold drinks are available. For cooler days, offer shawls or blankets – as well as heating lamps, if possible! Choose a ring pillow or vessel that matches your décor scheme and style. And remember – you don’t have to have a ring pillow at all! From vintage trays to seashells, choose a vessel that feels appropriate to you. 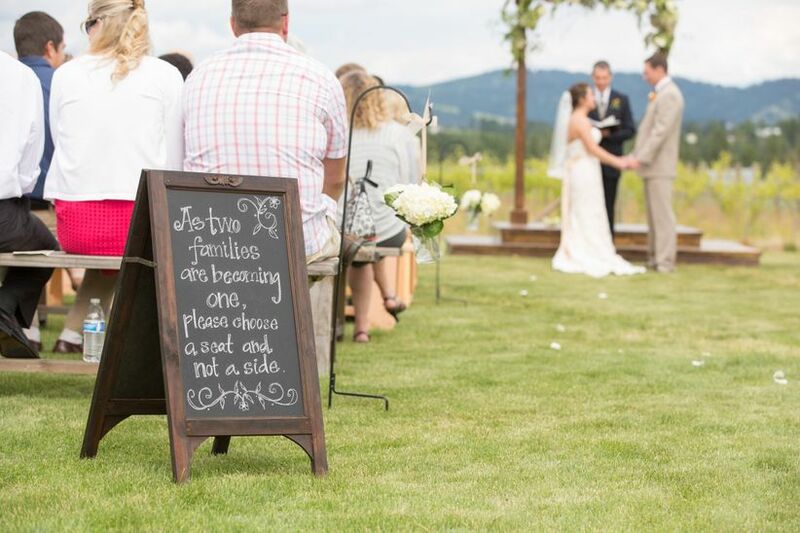 If your ceremony venue has flexibility, we love the idea of mixing up ceremony seating arrangements. From seating all of your guests “in the round” to incorporating modern lounge furniture, be creative, but be sure to keep your guests comfort in mind. You don’t have to write your own vows, but some couples like to include that super-personal element in their ceremony. After making sure it’s okay with your officiant, give yourself plenty of time to write a meaningful expression of your love (don’t wait until the night before – please!). Include a few personal anecdotes or details to describe your relationship and make sure to include a promise (or the actual “vow). And be sure to use your officiant as a resource or sounding board – they’re there to help! 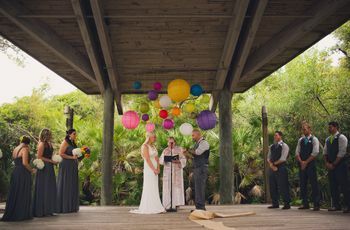 You may choose to include a unique ritual, like a handfasting, wine ceremony or sand ceremony into your ceremony – again, with the approval of your officiant. If you’d like to go this route, choose just one ritual in the interest of focus and brevity. 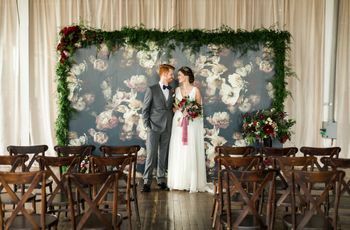 Whether it’s a lush floral display, a set of antique doors, or a creative arrangement of bright ribbons, paper pinwheels, or bunting, choose a ceremony backdrop that fits your wedding style. Include your monogram or initials throughout your ceremony décor to put your personal stamp on the day. From moss letters on the venue doors to a monogrammed aisle runner, there are lots of options to choose from. The traditional wedding processional includes the bride’s father walking her down the aisle – but you do not have to go this route. We’ve seen brides and grooms walk down the aisle with both parents, just a mom or dad, a sibling or two, or even hand-in-hand with each other. Those with stepparents may wish to walk half of the way down the aisle with a stepparent, then the rest of the way with a birth parent – there are lots of options to choose from. Think about your family situation and decide what feels most comfortable to you – that’s what’s most important. Many couples like to include special readings into their ceremony. Work with your officiant to source readings that are both meaningful to you and your spouse and appropriate for your ceremony style. From religious passages to selections from songs or children’s books to old love letters or emails you wrote one another, there are lots of readings to choose from. And it’s a great way to include family members or special friends into your ceremony. You’re married, time to celebrate! Choose upbeat music for this exciting time (we’re suckers for Stevie Wonder’s “Signed Sealed Delivered”). And if your venue allows, you can ask your guests to toss confetti or pom poms, blow bubbles, or wave ribbon wands or flags.